SAN DIEGO – The Navy is looking at several changes to its surface ship maintenance practices to keep costs down and on-time deliveries up, including considering a new contracting model and performing open and inspect work early enough for the results to influence the solicitation to industry. The Navy had previously awarded ship maintenance availabilities under a cost-plus Multi-Ship Multi-Option (MSMO) construct that prioritized a predictable workload for industry, and in 2011 it began moving towards a Multiple Award Contract/Multi-Order (MAC-MO) firm fixed price setup that prioritized cost control. “We’ve moved out of the MSMO construct over the last couple years into more of this firm fixed price environment, and so as I’ve watched this for the past year, what I will tell you is we were in kind of an era with MSMO where schedule was the number-one driver and we didn’t pay a whole lot of attention to cost, and we go into this new firm fixed price environment today where we’ve really put a premium on cost control and the industry out there has really responded,” Naval Sea Systems Command commander Vice Adm. Tom Moore said last week at the Fleet Maintenance and Modernization Symposium, hosted in San Diego by the American Society of Naval Engineers. Rear Adm. Jim Downey, NAVSEA deputy commander for surface warfare and commander of Navy Regional Maintenance Centers, said at the conference that the move to MAC-MO’s firm fixed price contracts “is causing us to increase our planning, and most of those ships are delivering to schedule.” In fact, he said, 90 percent of the ships currently undergoing maintenance and modernization are on track for on-time delivery. 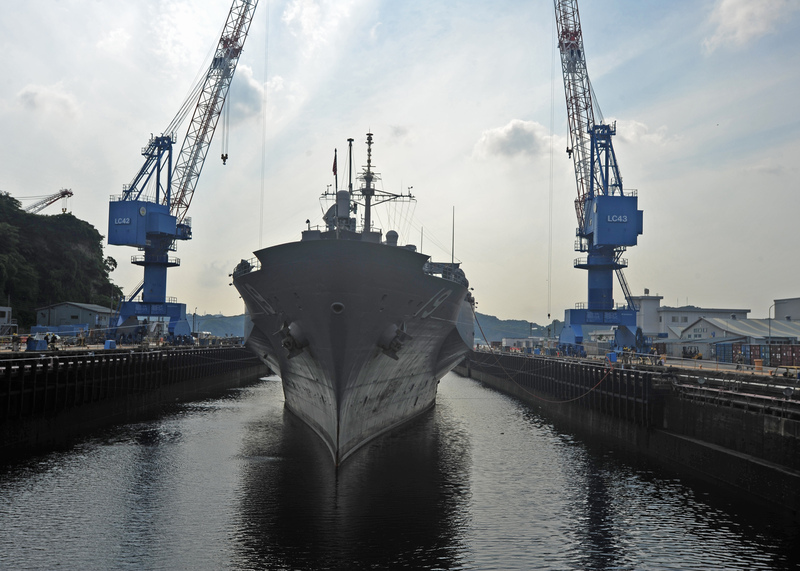 Downey said during a panel presentation that the Navy is expecting about 135 percent of its recent surface ship maintenance workload in Fiscal Years 2018 through 2020, and that extra workload will force the Navy and industry to get creative. “When you look at the 135 percent and you look at the amount of [upcoming docking availabilities], we need to do something differently, such as provide the opportunity to award multiple ships and multiple- or dual-docking wherever possible,” he told USNI News after a panel, explaining that there are some efficiencies associated with the same contractor working on two destroyers side-by-side, for example. 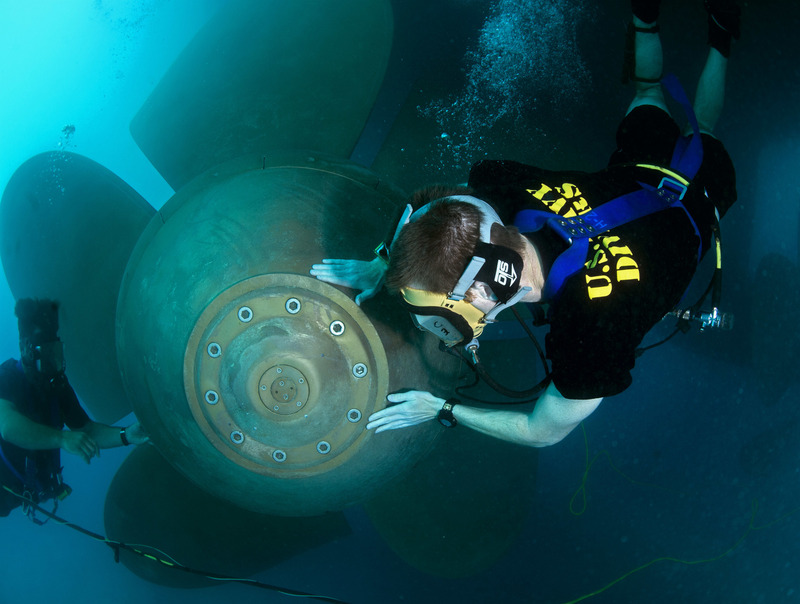 Finding efficiencies – which will both keep maintenance work on schedule and keep cost down – will be important with the greater workload and could inform the new hybrid contracting model NAVSEA is looking at now, he said. 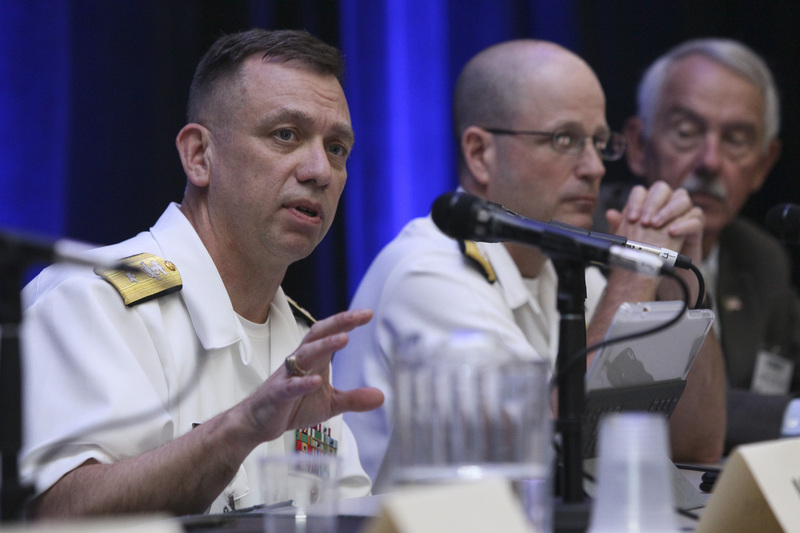 Rear Adm. James Downey, left, commander of Navy Regional Maintenance Center, answers questions during a panel discussion at the American Society of Naval Engineers (ASNE) Fleet Maintenance and Modernization Symposium on Aug. 15, 2017. US Navy photo. Additionally, Downey said he is pushing to get “open and inspect” work done much earlier in the process, so solicitations can include a more precise work package instead of assuming a certain percentage of work growth. Today, he said in his presentation, the open and inspect process is only required to happen before 20 percent of the maintenance availability is executed. “That’s not good enough,” he said. “I would like to get all the open and inspects done before the avail and put the results in the solicitation for you to do the work,” so the work package is accurate and the tank work doesn’t show up as “new work” later on, which impacts cost and schedule. “By not getting it in the solicitation, it guarantees that you’re going to have growth and new work in the availability. You’ve got it scoped in (to the solicitation) to do the open and inspect, but not the results of it. What we do there is we have industry provide us hours on what they think may be needed. So it’s one of the additional parts or final parts of the avail that’s not defined,” Downey told USNI News afterwards. Overall, though, he said the Navy already has teams that travel around the globe to support ships, so they could schedule the open and inspect earlier and work with fleet maintenance officers to ensure this early work would not affect the crew or operations. Downey said he hoped to implement this bumped-up schedule in Fiscal Year 2018. The ability to define work packages earlier and reduce the potential for new work later on is inextricably linked to on-time delivery and the success of the current contracting model. Several speakers also said the current MAC-MO relies on well-defined work packages, and as the Navy develops a new “hybrid” contracting model, that model’s implementation could be aided by improvements in accurate work packages. “I know that with firm fixed price we’ve shifted a lot of the execution risk to the primes and that they must now submit bids to enable them to somehow both win the contract and still make money. I get that,” Vice Adm. Tom Rowden, commander of Naval Surface Forces, said at the conference. Downey said the Navy had previously planned for 20 percent – or sometimes as much as 40 percent – new work growth in the availabilities, so standardizing how to do the open and inspect work and ensuring it occurs before the RFPs go out would create more confidence going into the availability.